Builders have long railed against inclusionary zoning, a popular municipal tactic that requires a number of homes in a new community be set aside for sale at below-market prices. Builders say it violates supply-and-demand common sense and yields less, not more, affordable housing. New research from the Los Angeles-based Reason Public Policy Institute bears them out. As mandated affordable units rose, new construction dwindled in this one-year study of 45 Bay Area Cities. In California, inclusionary zoning got an early start and is now in 20 percent of the state's communities. RPPI studied 45 San Francisco Bay Area cities with such ordinances to find that from 1973 to the present, inclusionary zoning created an average 228 affordable units per year. The Association of Bay Area Governments' targeted 24,217 units overall, which means that, at the present pace, it will take 100 years to meet the current five-year housing need. Rather than price controls, RPPI reports, "The real solution is to encourage the issuance of building permits, open more land for responsible development, and abolish zoning laws that unduly restrict development." The full 50-page report covers the issue in depth and can be downloaded for free. A 32-page follow-up shows the same trend in Southern California. RPPI believes these trends can be generalized. Comments on: "The Affordable Zoning Paradox"
Could Transparent Wood Be Building Material For the Future? The Taylor Junction townhome project to be built by the Jacobs Companies, Deerfield, Ill., could be the first ground-up subdivision in Illinois to be crowdfunded. 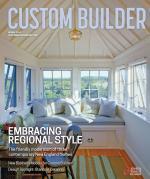 The Atlanta-based custom home builder opens a new design studio as part of its ExAct Design Experience initiative.